Shaggy in "Jake of Hearts"
A silent background character in Daria, and the old "Oh, The Obscurity!" flipbook on MTV's website said "the Daria artists like this mellow dude so much that he acquired the nickname "Shaggy"" - named for his uncanny (and deliberate) resemblance to Shaggy Rogers of Scooby-Doo fame. Shaggy is a skinny teen with unkempt light brown or dirty blond hair who wears an olive-green T-shirt, baggy gray or mauve pants, and stylish sunglasses even indoors. His earrings appear to have a long animal canine dangling from each. He has a long neck with a prominent Adam's apple, and his mouth is perpetually twisted to one side as if considering something or expressing mild disdain. 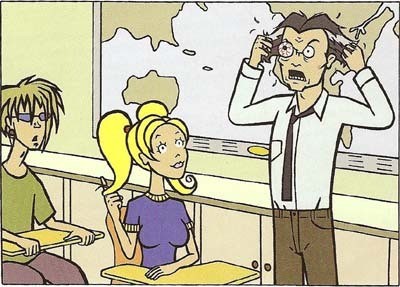 Shaggy in class, for once showing an emotion ("The Daria Database"). Shaggy appears in the very first Daria episode, "Esteemsters," at the back of the small group of new students that Principal Li is showing around Lawndale High. Daria and Quinn are at the front of the group. This implies that he, too, was a new student and beginning 10th grade there. He's also in a rear corner of Mr. O'Neill's self-esteem class with Daria and Jane. "Angel" was hanging around him early into "Esteemsters" and several other times in the series, implying the two hit it off quickly. In "The New Kid," Shaggy is revealed to be on the school's yearbook staff. He shares various classes with Daria and Jane in the series (such as Jane's math class in "See Jane Run"), but he never interacts with them. He went to the Mall of the Millennium in "Malled" and on the paintball expedition in "The Daria Hunter." He appears in two places at one time in "The Invitation" and "This Year's Model"
Despite being shown joining Lawndale at the same time as Daria, in "The Misery Chick" he is present in a flashback, watching Tommy Sherman play at a Lawndale Lions match, and appears to be a teenaged student... at least three years before the present day. In "Pinch Sitter", he either transformed into or swapped places with Angel in the middle of class... or was it vice versa? He has never, ever had any books, rucksack, or writing material in any classroom scene... but no teacher has ever called him on this and he manages to move up into every new grade. Somehow, despite never taking notes (unless they're sneaked into his pocket), he's remembering everything from class. More amazing than any of the above, in "Groped by an Angel" he is seen sitting at the same table as Quinn, listening to her alongside the Three Js: Quinn has been shown (e.g., "The New Kid") to be very particular about who sits at a lunch table with her, so how on Earth did Shaggy pull that off? He also has a knack for appearing during certain important events in the series: he watched Kevin Thompson crash his motor scooter and injure his leg in "A Tree Grows in Lawndale," he was aboard the doomed passenger ship Princess Fairy in "Just Add Water" (wearing a suit, no less), hears Daria's startling speech about her father in "Jake of Hearts," and is one of the few eyewitnesses to the falling out between Daria and Jane in a school hallway when Daria admits kissing Tom Sloane ("Dye! Dye! My Darling"). Even MTV has noticed this, and have canonised his duplication in "The Invitation" by explicitly referring to it in "Oh! The Obscurity! ": "he pops up in two places at once, defying physics". Shaggy appears sporadically in Daria fanfic as both a minor character and a prominent supporting character, but despite his peculiarities it wasn't until 2011 that he had a "breakout" role as a lead character. As a background presence, he appears in Richard Lobinske's First Summer story, "Fun on the Fourth," as "Beatnik Shaggy"; in Richard's story "Spelling It Out" as Dewey; in Canadibrit's "Process of Elimination" as Shaggy; and in Charles RB's "God Save The Esteem" as a member of Quinn's gang, who is honestly shocked to realise he's dressed like his namesake from Scooby Doo. His peculiar appearances on the show were given a fairly convoluted explanation in TAG's "A Hard Days' Night," which as expected involved supernatural forces & time travel, and made him responsible for the events of several key canon episodes. Here, he uses the codename Shaggy but is actually named Dewey. He has a somewhat substantial role in Jim North's "Trapped" as one of the students trying to escape from a nightmarish copy of Lawndale High. In this version, he talks and acts a great deal like his Scooby-Doo namesake. In Kara Wild's Driven Wild Universe installment, "In Her Own Words," Shaggy has a more prominent role as a character named Vince Rogers, founder of an infamous underground newspaper in the Lawndale area. Wild named him before the MTV website revealed "Shaggy" as his official name. This is his most notable appearance in fanfic so far. In February 2011 he had his first major lead role in fanfiction: Da Boss-King of Impze from Wassersauefer, where he has made a deal with an ominous shop owner and finds himself with strange powers. Shaggy, time-traveling with Josh, Kelly and others, in "The Misery Chick"
This page was last edited on 28 April 2018, at 17:24.